Coloring is a rite of passage for preschoolers and grade schoolers. Scribbling, shading, and creating with crayons are also lifesavers for occupying kids during a dinner out or a long wait at the doctor’s office. The amazing array of options for eco-friendly crayons out there just keeps growing, and we've got choices for everyone ranging from those with hands just learning to grasp to skilled coloring experts ready for exploring new artistic avenues. Read on for some of the brightest, greenest crayons around. Clementine Art‘s line of fuss-free and green art supplies has kept us creating and crafting all summer, and they are great for back-to-school time as well. 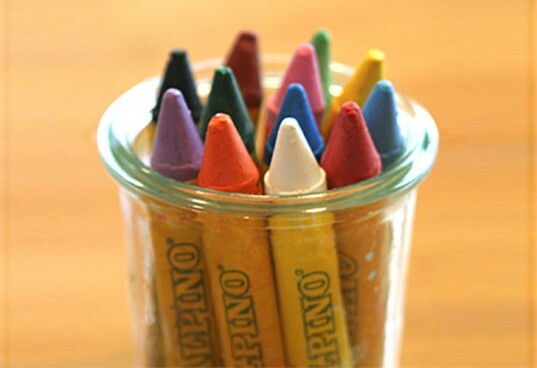 The brand’s soy crayons are colorful and a creamy consistency, and are offered in a more traditional shape as well as crayon rocks. Also made with beeswax, the crayon’s composition allows for easy blending and shading. 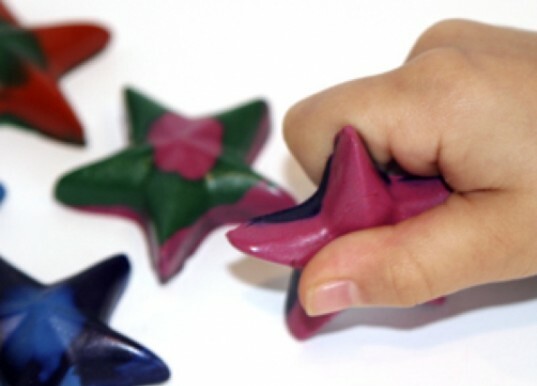 The traditional shape comes in a set of six basic colors, while the crayon rocks version, which includes nine colors, was designed to fit those precious little Picasso hands. 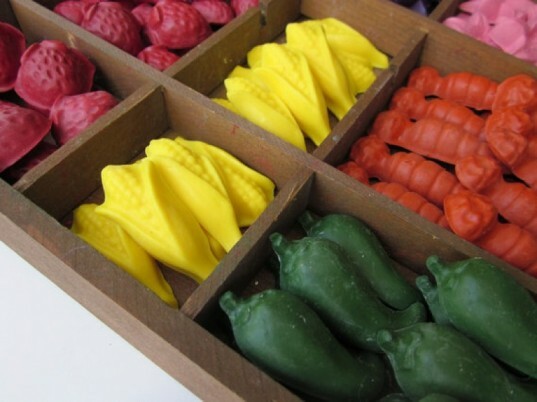 Stockmar‘s beeswax crayons might actually be safe enough to eat! We’re not recommending it to anyone, but more than one tot we know has thought crayons would make a good snack. However, these non-toxic crayons, which come in a set with 8 stick crayons and 8 block crayons and are made with food-grade dyes, may even stop or at least delay sibling spats: Younger children will find the block size easier to hold and harder to break, while older kids will likely gravitate toward the more traditional crayon shape. The blocks and sticks come in a tin container and are available from Hazelnut Kids. Earth Grown Crayons are like art supply eye candy. Made from soybeans grown in the US without herbicides or pesticides, these crayons come in oodles of shapes, including several endangered species as well as hearts and even a farmer’s market set. Biodegradable and made with non-toxic pigments, Earth Grown Crayons are created in colors bright and punchy, perfect for grabbing your tot’s eye and encouraging him to grab some paper and color away. Sparkles in your crayons? Why not? Crazy Crayons two-toned treats are made from 100% recycled crayons, which, through the National Crayon Recycling Program, employs people with disabilities and has saved more that 45,000 of crayons from entering landfills. These crayons go beyond the classroom – they would be great party bag stuffers, holiday gifts, or even an artsy, yet functional centerpiece for a kids gathering. It doesn’t get a whole lot more natural than eco-kids, whose handmade products range from eco-paints to ec0-dough to a new eco pad printed with 100% post consumer fiber. The ingredient list for their eco-crayons reads like a dream with beet, carrot, and cabbage extracts adding color and a base made from soy, beeswax, and palm wax. We love the sturdy looking crayon chunks, great for grasping little hands as they hunker down to create their next refrigerator masterpiece. Arts and crafts and water play combined? There’s nothing better on this earth. For art-loving kids ready to try a new medium, try experimenting with Alpino’s non-toxic watercolor crayons from Stubby Pencil Studio. Kids draw a picture first then brush water lightly over their creation, creating a beautiful watercolored effect. For ages 3 and up, these water color crayons promote creativity, in the art classroom or at your kitchen table, so kids can channel all sorts of inspiration-from Monet to Mommy! 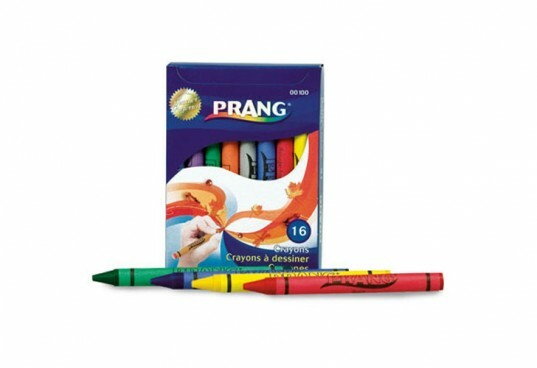 For a super affordable option that will also fit the bill for most school supplies lists, purchase Prang’s set of 16 soybean-based crayons, also available at Stubby Pencil Studio, which are made from 100% renewable resources and are free of paraffin wax. Prang promises these crayons to be brighter, smoother, and less flaky than others which, given the use and abuse that our kids’ crayons take, is a definite plus. Clementine Art's line of fuss-free and green art supplies has kept us creating and crafting all summer, and they are great for back-to-school time as well. 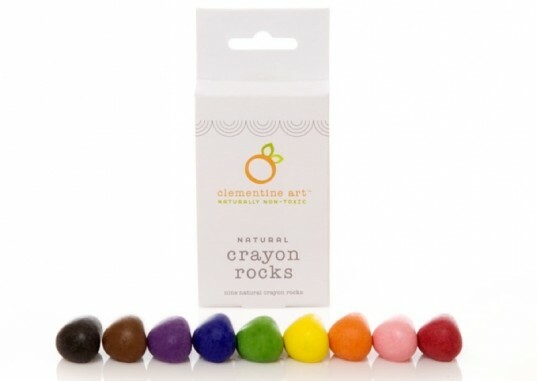 The brand's soy crayons are colorful and a creamy consistency, and are offered in a more traditional shape as well as crayon rocks. Also made with beeswax, the crayon’s composition allows for easy blending and shading. The traditional shape comes in a set of six basic colors, while the crayon rocks version, which includes nine colors, was designed to fit those precious little Picasso hands. 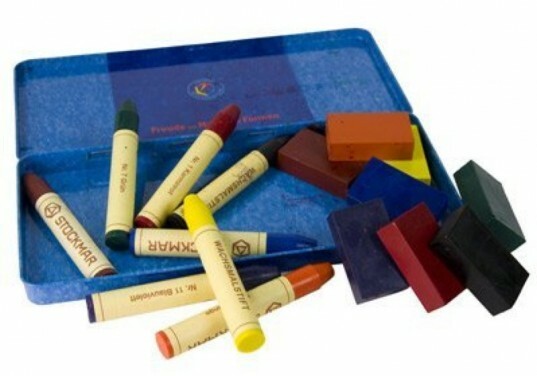 Stockmar's beeswax crayons might actually be safe enough to eat! We're not recommending it to anyone, but more than one tot we know has thought crayons would make a good snack. However, these non-toxic crayons, which come in a set with 8 stick crayons and 8 block crayons and are made with food-grade dyes, may even stop or at least delay sibling spats: Younger children will find the block size easier to hold and harder to break, while older kids will likely gravitate toward the more traditional crayon shape. The blocks and sticks come in a tin container and are available from Hazelnut Kids. Earth Grown Crayons are like art supply eye candy. 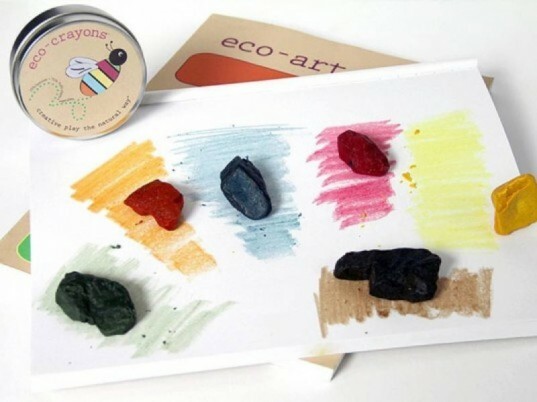 Made from soybeans grown in the US without herbicides or pesticides, these crayons come in oodles of shapes, including several endangered species as well as hearts and even a farmer's market set. Biodegradable and made with non-toxic pigments, Earth Grown Crayons are created in colors bright and punchy, perfect for grabbing your tot’s eye and encouraging him to grab some paper and color away. Sparkles in your crayons? Why not? Crazy Crayons two-toned treats are made from 100% recycled crayons, which, through the National Crayon Recycling Program, employs people with disabilities and has saved more that 45,000 of crayons from entering landfills. These crayons go beyond the classroom - they would be great party bag stuffers, holiday gifts, or even an artsy, yet functional centerpiece for a kids gathering. It doesn't get a whole lot more natural than eco-kids, whose handmade products range from eco-paints to ec0-dough to a new eco pad printed with 100% post consumer fiber. The ingredient list for their eco-crayons reads like a dream with beet, carrot, and cabbage extracts adding color and a base made from soy, beeswax, and palm wax. We love the sturdy looking crayon chunks, great for grasping little hands as they hunker down to create their next refrigerator masterpiece. Arts and crafts and water play combined? There's nothing better on this earth. For art-loving kids ready to try a new medium, try experimenting with Alpino's non-toxic watercolor crayons from Stubby Pencil Studio. Kids draw a picture first then brush water lightly over their creation, creating a beautiful watercolored effect. For ages 3 and up, these water color crayons promote creativity, in the art classroom or at your kitchen table, so kids can channel all sorts of inspiration-from Monet to Mommy!